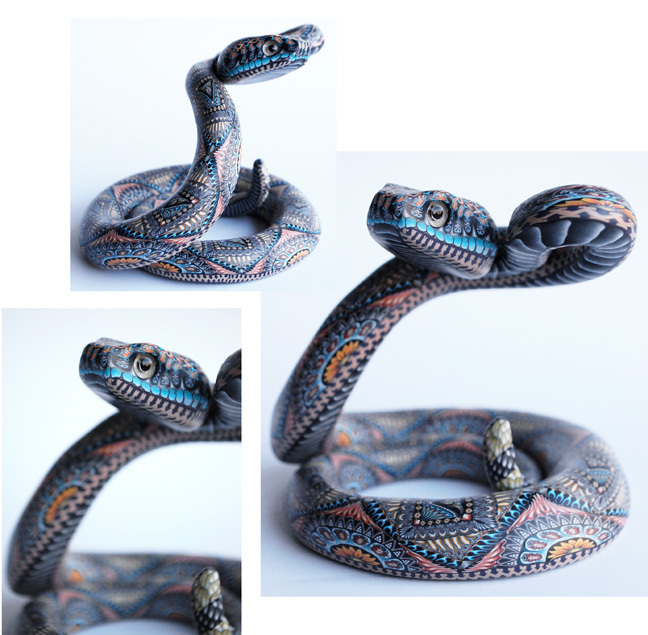 Jon Anderson’s Fimo Creations are simply the foremost polymer clay artist in the world today. His amazing technique has been honed by over a decade of hard work, creative vision and dedication to the demanding art of polymer clay sculpture. Born in Kingman, Arizona, Jon studied art at the Universidad de las Americas and holds a master’s degree from Texas A & M University. An accomplished painter, sculptor and jewelry designer, Jon has lived among an incredibly diverse cross section of the world’s people, from Central America to the Far East. 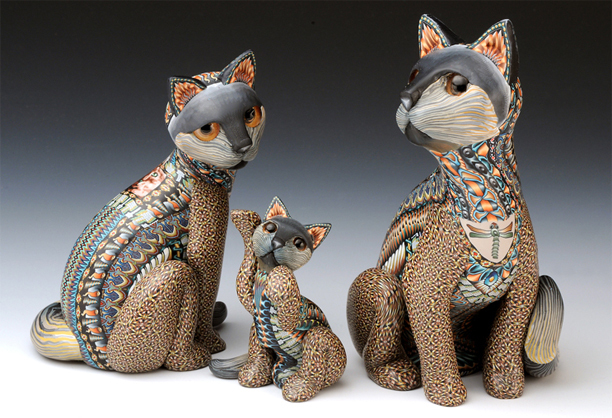 His Fimo designs show the influences of classical Moorish motifs, Native American spirit figures, ancient petroglyphs, Celtic themes, and more. Fimo is a polymer or non-terrestrial clay. These clays are available in a variety of stock colors, but Jon is constantly blending and mixing them to create his own palette. The clays evolve into the hues and fades that are the basis for the next step, the images themselves. The images and patterns are all created by Jon’s hand. He begins by laying canes or blocks of different colors of clay next to each other, starting from the center of the design and working outward, creating a number of visual borders around the original image. Each of these illustrations in clay is the size of a large loaf of bread when first constructed, and the loaf is then stretched to double its length and cut in half. This process is repeated over and over, each time reducing the actual size of the original image or illustration by half until the final cross section is the size of a small coin. The small canes are then thinly sliced into intricate tiles using a surgical scalpel. This process is the same for each unique design, and each animal is made up of multitudes of different images, amounting to hundreds of these tiles being hand-applied to every sculpture.